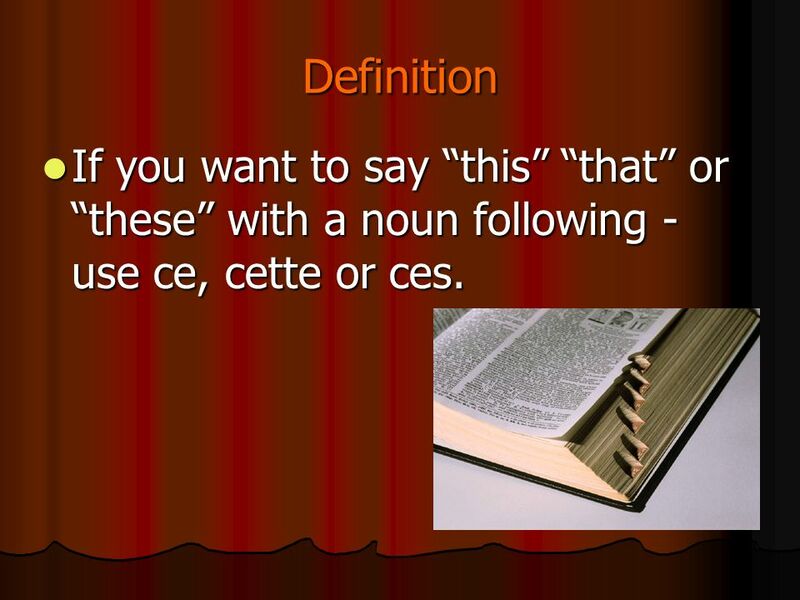 Ce, Cette, Ces Ce/Cette/Ces means this, that or these. Ce is used for masculine nouns Cette is used for feminine nouns Cette is used for feminine nouns. 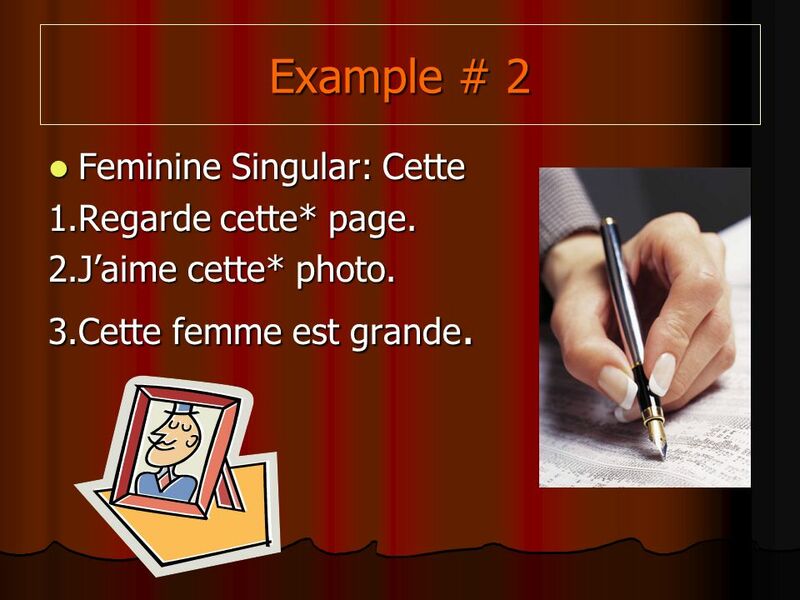 3 Example… Masculine Singular: Ce/Cet Masculine Singular: Ce/Cet 1.Regarde ce* livre. 2.Jaime cet* article. 3.Cet* homme est grand. There is a reason for both ce and cet. 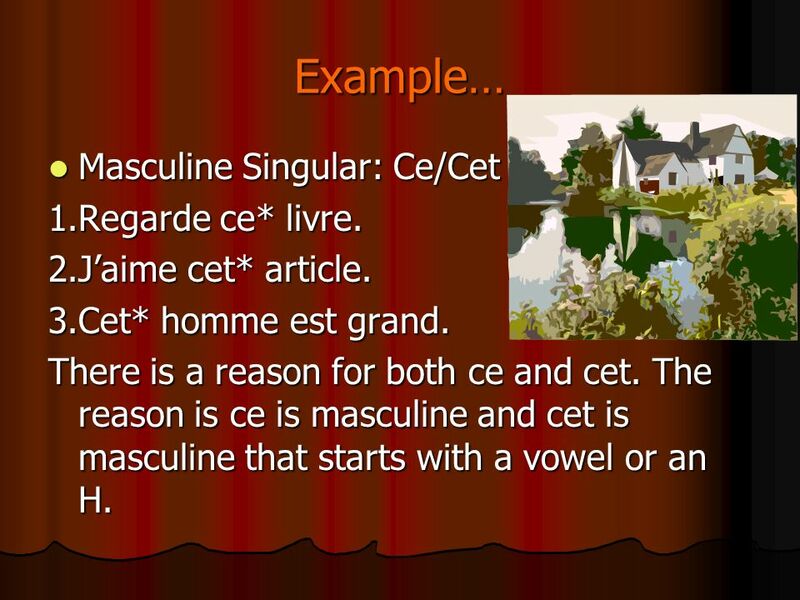 The reason is ce is masculine and cet is masculine that starts with a vowel or an H.
4 Example # 2 Feminine Singular: Cette Feminine Singular: Cette 1.Regarde cette* page. 2.Jaime cette* photo. 3.Cette femme est grande. 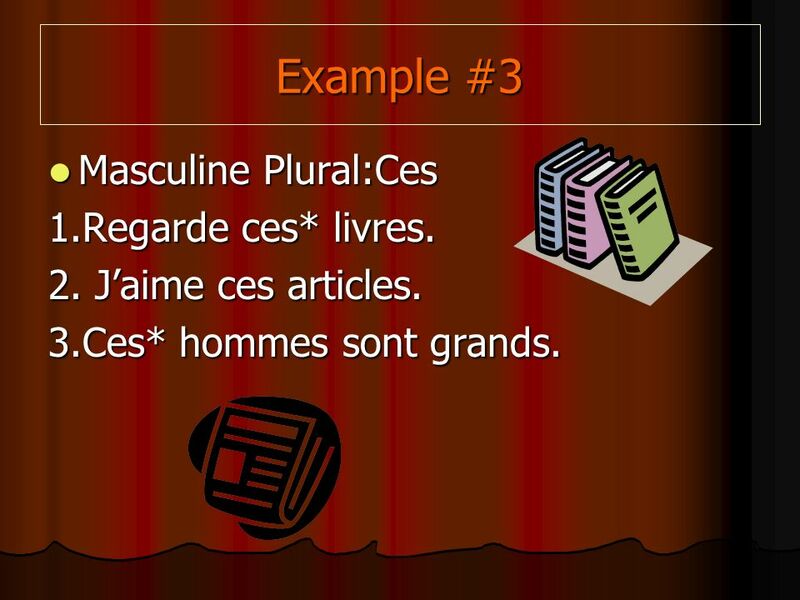 5 Example #3 Masculine Plural:Ces Masculine Plural:Ces 1.Regarde ces* livres. 2. Jaime ces articles. 3.Ces* hommes sont grands. 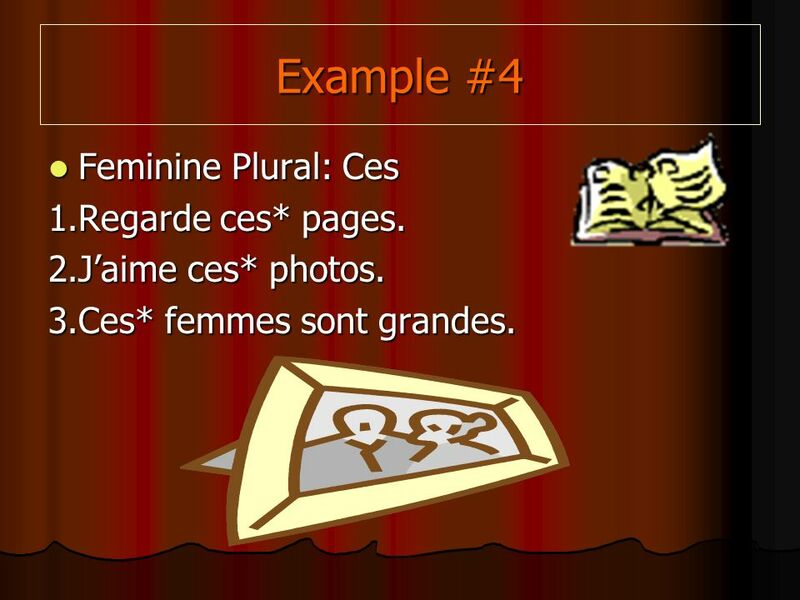 6 Example #4 Feminine Plural: Ces Feminine Plural: Ces 1.Regarde ces* pages. 2.Jaime ces* photos. 3.Ces* femmes sont grandes. Télécharger ppt "Ce, Cette, Ces Ce/Cette/Ces means this, that or these. 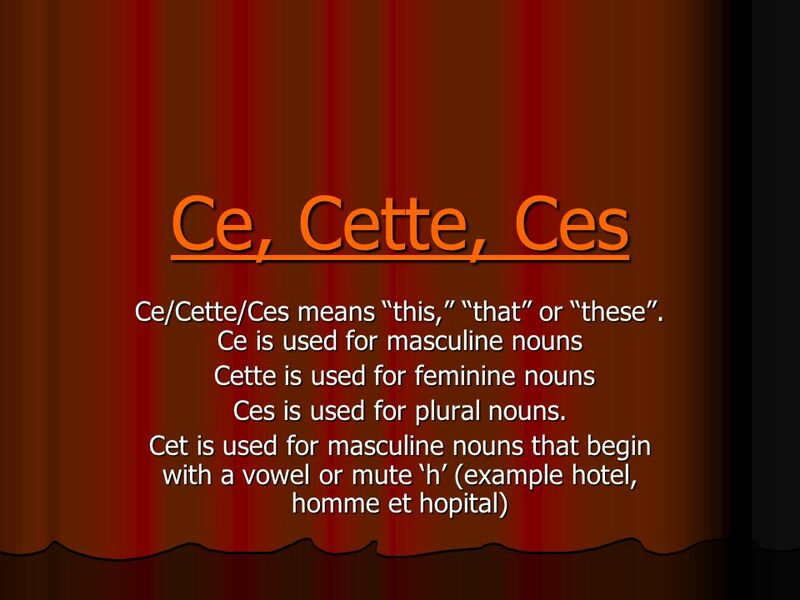 Ce is used for masculine nouns Cette is used for feminine nouns Cette is used for feminine nouns." Relative pronouns Relative pronouns are used as replacements for a repeated noun or pronoun in a subordinate clause. TWO SENTENCES: I am looking for my. 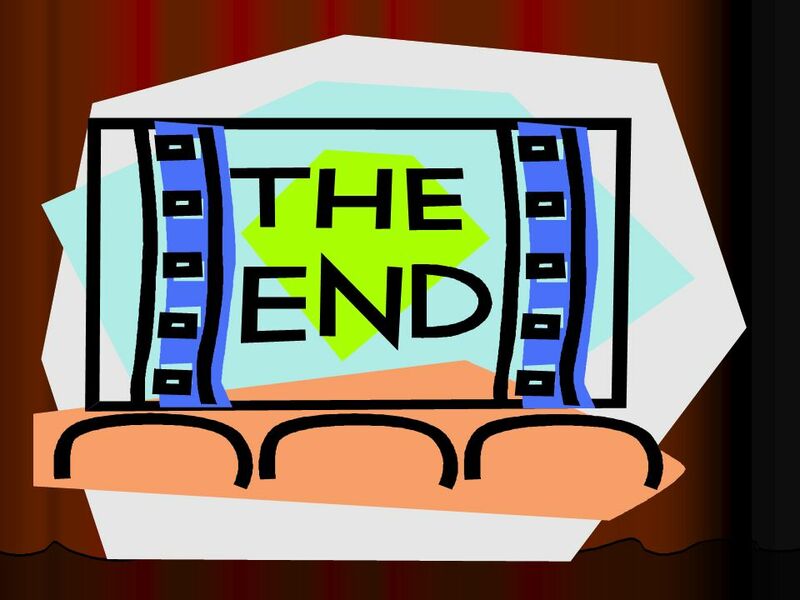 Article Review Definite articles (the) MascFemplurneg l(e)l(a)les Indefinite articles (a, an, some, any) MascFemplurneg ununedesd(e) Partitive articles. WHAT/WHICH ONE? THIS ONE!. Review the forms of quel meaning what or which: MasculineFeminine Singular Plural. Français II: Examen #1 mardi, le 6 octobre. Information about the adjectives for old, new & beautiful in French Special care needed!